We're looking forward for any feedback! Jaw dropping. I can only guess the amount of work behind. wow, that's a really impressive, fun, and cool game! One of the best things I've seen done using Impact to date! The "Final Challenge" was indeed challenging. I got to wave 3 but was not able to pass it. What tool did you use to make your sprites? @Joncom the final challenge is easy, you just gotta spam the balls by repeatedly clicking the left-mouse. Yes, however if you spam, your shots do not "stagger" the baddies which are charging, and then they eat face. The mice enemies get canceled out of the charging by any attack. So it's really just spamming balls. Today we have a very big technical post about path finding in CrossCode. Maybe that's interesting for some of your guys. @Nozferatu We just use common image editing programs. For spriting we can recommend graphics gale. 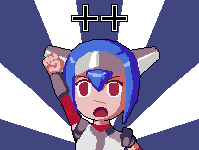 We recently implemented NPS in CrossCode with dialog system and everything. Very nice...I like your game a lot. It reminds me of those old school games from Square Enix such as Final Fantasy 6 on SNES and Chrono Trigger. Guys, I will be really one sad man if you don't finish and release this game. What you've done is simply a console-grade game. I'm amazed. Please release this game, get rich, turn into full-time devs. And please stop calling your game "a game of throwing energy balls". This downplays it. Oh, and I just tried it with hi-res on Mac. Safari shows a blank screen and just plays the music. Firefox is OK. Easily the most technically-impressive and polished Impact game I've seen -- nothing comes close. I look forward to the final game! Hi there guys! Thanks for all the recent answers! @dungeonmaster Going full time is what we intend. CrossCode might make problems on Safari. We will probably look at this before we have our next release. Hey Guys! Long time no read, right? CrossCode made a lot of progress over the last few month! We're currently planning to change the colors of our shock effect. Not sure if we should use yellow or purple here. So we'd like to get our opinion. thanks - this is great stuff !! !